North Crestview is the Area of Growth, now and in the future! New Publix Shopping Center, a major success, New Wendy's on Corner out-parcel, New Waffle House to the South. THE Great thing about this area is there are parallel streets to get out of the main stream of traffic whereas on the South end almost all traffic has to feed onto Hwy. 85 South. 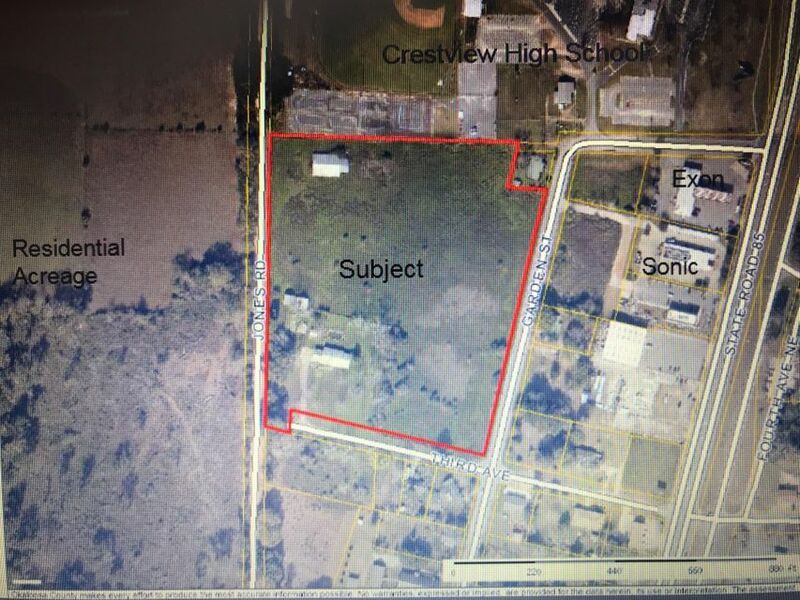 This great property, lying adjacent to the South Boundary of the Crestview High School is ideal for many different uses - Retail, Medical, Apartments, Recreation. Surrounded by 3 Streets for ingress and egress from all directions. This property is in the County, however, City Water and Sewer is on site. Additionally a 2500 SF Brick Dwelling is in the SW Corner of the property given little value to this Development property but has potential. Other significant businesses in area are Winn Dixie Plaza with numerous other businesses, 5 Financial institutions, Post Office, Chamber of Commerce, Public Library, Convenience Stores, Sears Hometown Store, Office plazas, Restaurants and Fast Food, Churches, Wholesale Plumbing and others. In addition to the High School is the Davidson Middle School, and with access by Jones Road, an easy walk to Bob Sikes Elementary School. Vacant Property to the West ideal for future residential development to enhance the value of this property! It is one block off Hwy. 85, but a traffic light is in place at Hwy. 85 and Garden plus very easy access to the South. It is a Great location - with Plenty of convenient access, and Definitely priced right!